Complete website solution, online business strategy, web design concept, programming development, flash elements, content management and database system, content research & writing, photos, SEO, Internet marketing, tracking & monitoring, domain and hosting, updates. Following increased interest, this project will soon be transformed to incorporate an e-shop, able to sell certain products throughout Cyprus, as well as on an international level. Located in the heart of old town Nicosia, Cyprus, Utopia store has been part of the local herbal scene for over 20 years, trading under a different name. This family-run business has been farming and supplying most of Cyprus with natural, home-gown Mediterranean herbs and vegetables, as well as exporting to many international markets. In 2007, the store was refurbished and re-positioned, developing its overall concept and physical presence. Now supplying a diverse amount of natural and organic products, from food items, herbal and essential oils, environmentally safe cleaning products, art & craft, clothing, pots & plants and books. As well as supporting local produce, manufacturers and artists. Being located within the Venetian walls of this ancient city, it can be quite difficult to stumble across or even find Utopia store when intentionally looking for it. Thus, customers heavily revolved around those that knew of it well and strong word-of-mouth. Indeed, a plausible channel, but not enough to grow. Once the store was completed, the owner and managing director set out to boost awareness and firmly establish its presence within the larger community. The Internet was no doubt the perfect medium to truly express the store's value and unique character, consequently becoming the primary marketing focus. Being himself creative and very much involved with all projects relating to Utopia business, the owner sat with Web-Conceptions on numerous occasions for extensive brainstorming sessions. Many of these took place in the store, so a clear understanding of products, service and clientele could be developed. It was vital that the style and direction of the website fit the store's overall concept and the owner's philosophy; namely in terms of the website's aesthetics elements and written web content. 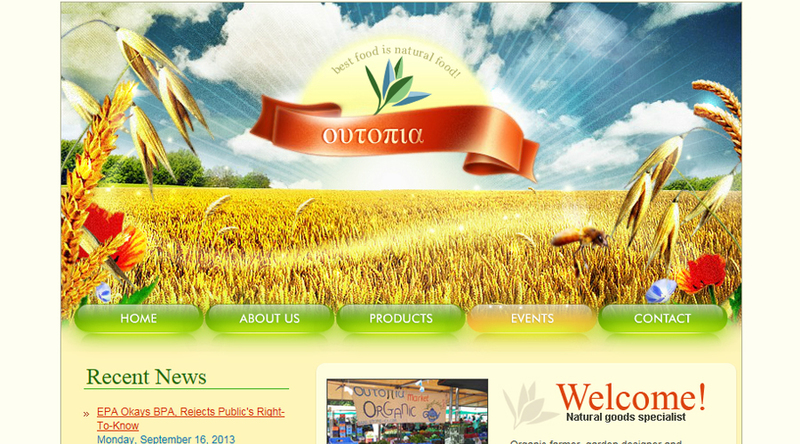 Search Engine Optimisation: to rank high when searching for words such as "natural organic store Cyprus Nicosia"
Utopia-cy.com is now achieving high SEO and ranking in all major search engines and with all relevant and pre determined and thought-out key words - easily the best in the country (Cyprus). Hits to the website continue to increase, whilst sales multiply. The local community now knows Utopia store very well, where it is and what its all about; new people are learning about the concept by the day. Probably the most rewarding result is the numerous compliments Web-Conceptions and Utopia store have received regarding the website; looks fantastic and reads well. Above all, serving its purpose to boost awareness for Utopia store and increase business activity, as well as social responsibility.